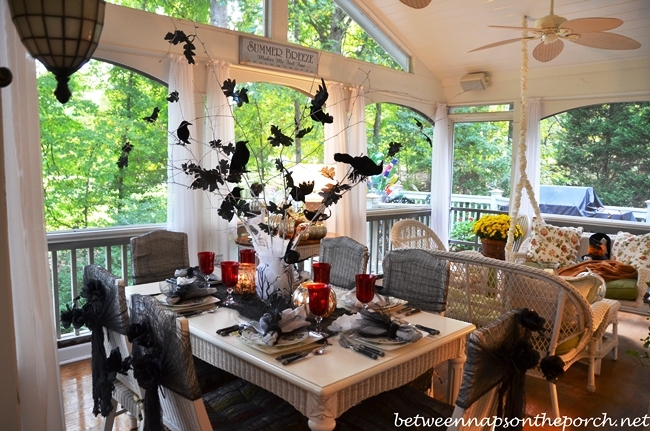 Ohhh this black and red Halloween tablescape just makes us quiver with excitement! It is so creepy and spooky yet totally wicked. We adore this crow tree centerpiece, it really makes the whole table! The black leaves are really cool and so are the sitting crows. It is a lovely combination. We also adore these black gosling chair covers with black roses. It is so Halloween! The red goblets are such a nice touch too along with the black wired runner and the sheer napkins. It all makes for a wonderfully eerie black and red Halloween tablescape combination.